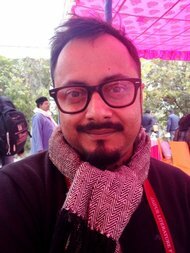 Vishwajyoti Ghosh, a graphic novelist and artist based in Delhi, is curator of the book “This Side That Side: Restorying Partition,” an anthology of graphic narratives from India, Pakistan and Bangladesh. His first graphic novel, “Delhi Calm,” was published in 2010. At the Jaipur Literature Festival, Mr. Ghosh spoke with India Ink about the significance of collaborating with 48 different contributors, and what it means for younger generations to retell the history of Partition in a graphic format. What do you think it is about the graphic element of the anthology that makes the stories of Partition come alive? Not only Partition. I think there’s a certain attitude and angle of the graphic narrative in that you want to make your opinion felt visually. The text is not secondary besides the graphic narrative, but the visual is clearly the leader that makes you move from frame A to frame B. And there has to be a reason for you to do a graphic novel. What the graphic narrative always demands from the reader is to participate in the storytelling, to make it travel. And in the context of Partition, there’s a whole baggage of history that we’ve dealt with. There’s a whole baggage of even visual history that we’ve dealt with, from cinema to theater to photography of that era. How do you reprocess that? How do you make a comment about whatever we have in our heads? Yes, and about that processing — the tagline for this book is “Restorying Partition.” So what exactly do you mean by “restorying”? One thing we felt from the beginning is that we should do away with these myths that Partition is a 1947 thing. Partition is not only about the exodus but about the little Partitions that we carry in our heads. When I was trying to get hold of a few Bangladeshi authors, especially the young ones, for example, many people told me, “I was not born during ’71, and I don’t know much about the Liberation War, so I wouldn’t know.” But I was trying to tell them that there was another Partition that happened in ’47. They didn’t even know about it. So what has happened is that memories have also gotten partitioned and stuck on the timeline. So in my opinion, it’s not about what happened. We all know what happened. It’s also to see how we reprocess all of that, and how subsequent generations negotiate around that. Yes, and some critics have noted that it’s mostly younger people who haven’t experienced Partition themselves who are writing and telling the story again. And right now there is a push to capture the oral histories and testimonies from the survivors of Partition. So what does the younger generation bring to this anthology that we wouldn’t get from these actual histories? You know, I feel that every story from Partition is actually a translation. Because when my grandfather tells me a story of the Partition, he’s already translating the experience — which might be a bit of memory, a bit of storytelling, a bit of exaggeration and a lot of truth. And when that moves to generation three, for example, we’ve already chosen what we’ve chosen to remember, because we have a certain a way of looking at it, and a certain awe. Many of the contributors are not retelling their own grandparents’ stories, but just telling about these characters themselves. There’s a line, “All of the stories died with him, and all that remains of him is a certificate.” So there’s an entire experience of Partition that becomes a death certificate. Or a refugee certificate. Now how does that deal with Partition directly? It doesn’t. But there’s a backlog of these stories in our heads. What do you think then future generations will understand of Partition? Do you think there is more of an effort to distinguish between the different countries, or are people really trying to speak of themselves as South Asians — as in, this is our universal history? See, as long as these borders exist, there will be super opaque walls that will try to keep us separate. But when you build those super opaque high walls, you also increase the curiosity. You always wonder what’s on the other side of the wall, because access is denied to you. And as long as that curiosity stays, a friendly, healthy mix of dialogue will stay, which I think is critical. That’s why it was so important we had collaborations in this book. We would have a Pakistani writer and an Indian artist, and an Indian writer and a Pakistani artist. Why was that done? So that at least they get to know each other’s stories. They’ve respected each other and worked together, and that’s a beautiful dialogue. This piece was originally published on January 21, 2014, on the New York Times.